Open Orthodoxy is a new stream of Orthodox Judaism. It is a term that was coined by Rabbi Avi Weiss, founder of Yeshivat Chovevei Torah and Yeshivat Maharat. 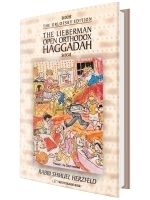 This Haggadah, which features an introduction from Rabbi Weiss, discusses many of the issues that are most identified with Open Orthodoxy.